The online version of this article ( https://doi.org/10.1186/s12977-019-0473-2) contains supplementary material, which is available to authorized users. It has been known for nearly 50 years that the exact sequence of the PBS determines the specific tRNA that can bind and/or the affinity of the tRNA to the PBS [2, 3, 4]. HIV and SIV both preferentially bind tRNALys3 to initiate RT, as the acceptor stem of the tRNA molecule is perfectly complementary to the PBS of both HIV and SIV (PBS-Lys3) [5, 6, 7, 8]. Mutations in the PBS sequence could therefore lead to less efficient binding of the canonical tRNALys3, potentially affecting reverse transcription and viral replication [9, 10, 11]. The cytosine (C) to thymine (T) point mutation in the SIVmac239 PBS identified by Alexander et al. reverts to the canonical C, suggesting that alternate tRNAs such as tRNALys5, which is fully complementary to the suboptimal PBS-Lys5 do not function well or are insufficiently expressed in host cells [3, 9]. Indeed, Soderberg et al. describe reversion of this nucleotide in an SIVmac239 derivative in vitro and report drastically increased replicative fitness following this reversion. Previously, we described the generation of an SIVmac239 clone that has 4 suboptimal mutations repaired to the canonical (and presumably optimal) bases (SIVmac239Opt). Reversion of the PBS was rapid in vitro even after a single round of infection. We suggested this reversion occurred when RT was primed by tRNALys3, despite its imperfect complementarity to wild-type SIVmac239 PBS. If primed with tRNALys3, resultant integrated viral genomes would contain a mismatch at position 8 in the PBS, which could be resolved by cellular DNA repair mechanisms [13, 14, 15]. This study also describes the benefits of using SIVmac239Opt in NHP studies as this model eliminates the uncontrolled variable of suboptimal nucleotide reversion during in vivo studies. 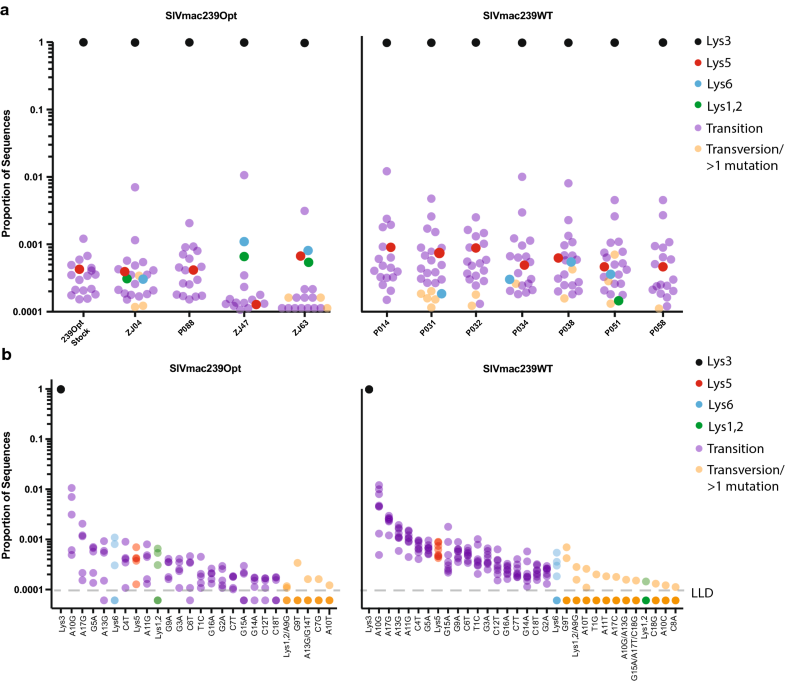 It has been suggested that the proportion of the tRNALys variants found in the host cells determine the proportion of PBS-Lys5 and PBS-Lys3 viral genomes. 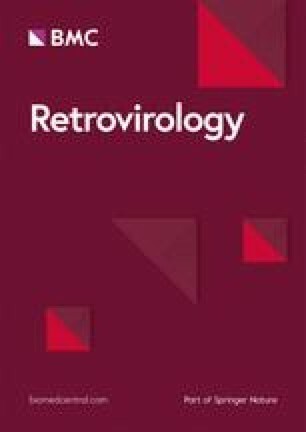 Given the estimated proportion of tRNA in human cells, it was proposed that 5% of all progeny virus would contain the PBS-Lys5 sequence regardless of the sequence of the infecting virus [14, 15], although the rate to reach this equilibrium was not estimated. One of the mechanisms used by retroviruses to ensure replication competency upon infecting target cells is to incorporate the tRNA used to prime reverse transcription into the nascent virus particle. For example, Rous sarcoma virus (RSV) selectively packages tRNATrp, and Moloney murine leukemia virus (Mo-MuLV) packages tRNAPro (though to a lesser extent) . Similarly, tRNALys is selectively packaged into HIV and SIV virus particles via binding of the lysyl-tRNA synthetase protein and the Gag and Gag-Pol proteins [17, 18, 19] such that tRNALys molecules are enriched approximately tenfold in the virus particle . Furthermore, previous studies demonstrate the presence of tRNALys1,2, and tRNALys3 in the viral particle, although other tRNALys isotypes have not been directly queried [20, 21]. Others suggest that the binding of the tRNA to the Gag-Pol protein occurs concomitantly with translation, and thus the tRNAs selected are dependent on the local tRNA concentration [22, 23]. Regardless of the mechanism, we show here that the presence of PBS-Lys1,2 sequence in viral genomes corresponds to tRNALys1,2 being used as primer for RT initiation. Previous studies demonstrate the usage of this tRNA to prime HIV RT in a manipulated in vitro system (suggesting also that the reverse transcriptase is not specific for tRNALys3) [24, 25], yet here we find evidence for its use in vivo. Whereas the identification of other transition mutations (and indeed also the PBS-Lys5 sequence in macaques) may be attributed to random mutations arising during RT or PCR, it is highly unlikely that the 5 mutations necessary to generate the PBS-Lys1,2 sequence are due to in vitro errors. Additionally, the 2 changes required for PBS-Lys6 to be generated from the canonical PBS are unlikely due to cDNA synthesis or PCR error even though both mutations are transition mutations. These data were confirmed by the identification of PBS-Lys1,2 sequences in the LANL HIV database with 10 PBS-Lys1,2 sequences found in HIV and 1 PBS-Lys6 sequence found in SIV. 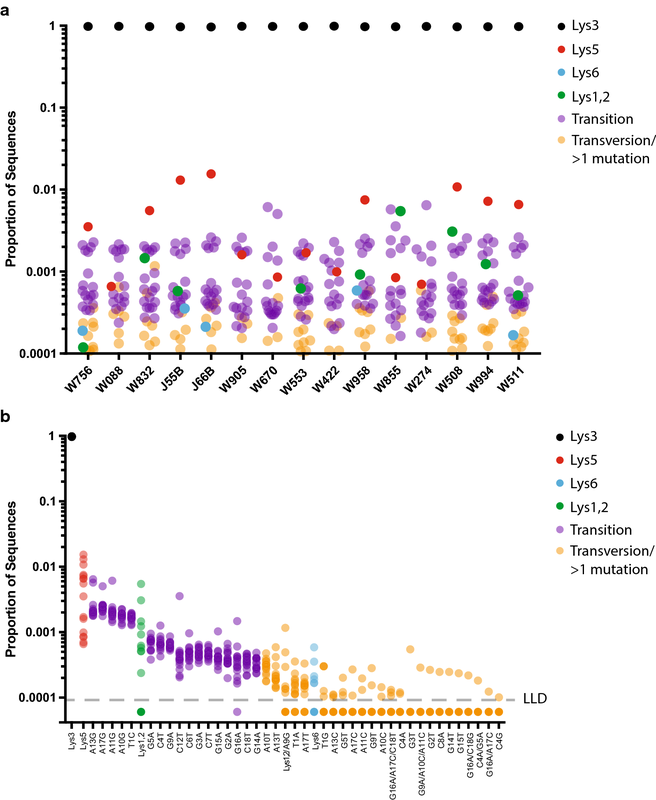 Interestingly, we also found most of the other transition/transversion mutations detected in our deep-sequencing approach in the LANL database. These mutations do not correspond to the acceptor stem of any tRNAs, Lys or otherwise, and may just be the result of cDNA synthesis or PCR error. Also of interest, although previous studies demonstrate that tRNAIle and tRNAAsn are also packaged into the HIV particle , in our study, we do not find any evidence for the involvement of these tRNAs in RT initiation. Additional file 1: Table S1. Results of searching the LANL HIV database for all detected PBS variations. 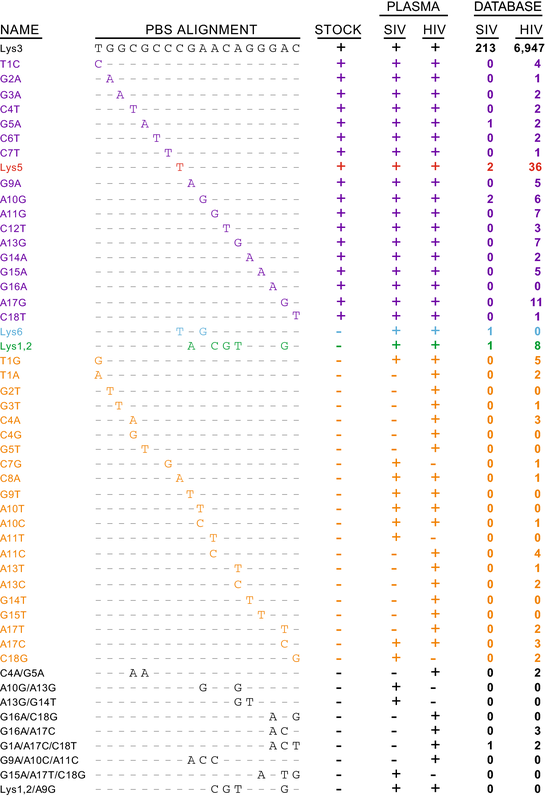 Sequences highlighted in blue correspond to HIV-1, sequences in green correspond to SIVmac sequences, and sequences in orange correspond to other natural-host SIV sequences.